Some things are best taught by demonstration, and the effective application of makeup is no exception. 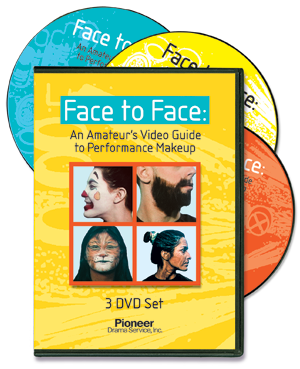 Face to Face: An Amateur’s Video Guide to Performance Makeup is an ideal instructional tool for this important element of the theatrical arts. A professional makeup artist utilizes a number of different student faces to demonstrate in detail the vast gamut of makeup, from applying the base to taking the makeup off, and everything in between! Read more...Whether you are altering physical features, such as applying a bald cap, crepe hair beard, or putty nose; turning a performer into a cat, clown, or a witch; or applying basic stage makeup for a natural, middle age, or old age character, you will get all the help you need by viewing these entertaining, instructional DVDs. ACT ONE: Creating a Character acts as a starting point, addressing the intent of makeup and how it helps an actor create a unique character. ACT TWO: Basic Stage Makeup takes you into the dressing room, discusses the details to consider before makeup application, and demonstrates the process of applying Natural, Middle Age, Extreme Old Age, and Corrective Makeup. ACT THREE: Special Applications demonstrates how to drastically change physical features: Putty Wax nose and cut, Liquid Latex old age skin wrinkling, Rigid Collodion scars, Bald Cap, Crepe Hair beard and mustache, and Prosthetic Devices. ACT FOUR: Fantasy Makeup demonstrates the use of makeup to bring ’non-realistic’ characters to life: Clown, Vampire, Witch, Zombie, Cat/Animal, Werewolf, and Alien. ACT FIVE: Cleaning Up shows the proper removal of makeup, helping to prevent problems such as skin irritation and rashes. This three DVD package addresses many issues pertaining to makeup, offering instructor and student alike an in-depth course in basic makeup techniques as well as solutions for specific makeup challenges. Whoever uses these videos will find them an effective, entertaining tool. Face to Face truly is a must in any theatrical library.